Acids react with metals that is more electropositive than hydrogen in the electrochemical series to produce salt and hydrogen gas. Acids do not react with copper and silver. This is actually a displacement, where the metals that are placed above hydrogen in Electrochemical Series displace hydrogen from acid. 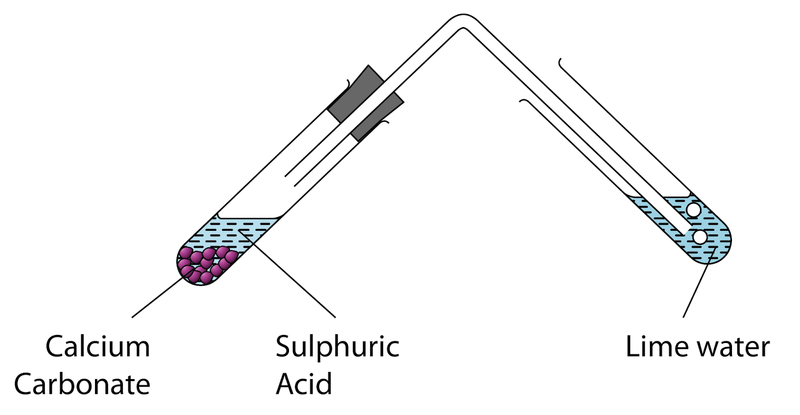 About 5 cm³ of dilute sulphuric acid is poured into a test tube. One spatula of zinc powder is added into the acid. A burning wooden splinter is placed at the mouth of the test tube. Colourless gas is released. A “pop” sound produced when the wooden splinter is placed at the mouth of the test tube. One spatula of calcium carbonate powder is added into the test tube. The gas released is passed through lime water as shown in the diagram above. Colourless gas is released. The gas turn lime water chalky. Sulphuric acid reacts with calcium carbonate. The gas released is carbon dioxide. 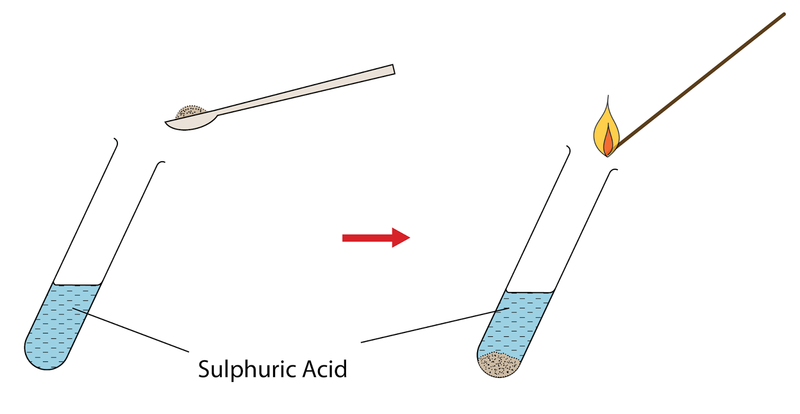 One spatula of copper(II) oxide powders is added to 5cm³ of hydrochloric acid in a test tube. The mixture is heated slowly and stirred with a glass rod. The colourless solution turns blue. The copper(II) oxide powder (the black powder) has reacted with the hydrochloric acid. The blue colour solution contain copper(II) ions. 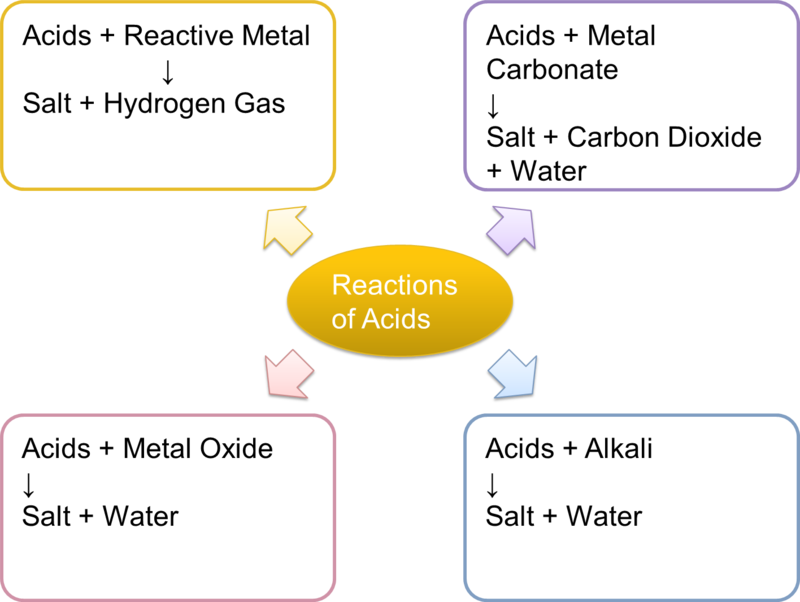 Acids react with alkali produces salt and water only. This is called a neutralisation reaction. Write the chemical equation of the reaction. List down all the ion presence below the equation. Cancel the ions that do not change in the reaction. Rewrite the equation with only the ions that have changed in the reaction. We can use any acid for the reaction, as it will not affect the ionic equation at the end. In this case, let’s use hydrochloric acid for the chemical equation.